Continue your light and carefree feel with something fun and joyful. What may you ask will add this feeling? Bubbles! This is the ideal way to add a bit of excitement to your bridal exit. Leave little bottles out for your guests and get ready to walk through a cloud of bubbles. Let's be honest, when you are exiting your wedding, all you want to do is cheer! You're married, yay! Your guests will feel the exact same way so let them cheer along with these fabulously colourful pom poms. Create these in colours which match your theme to ensure they fit into your dream wedding perfectly. It's one of the most classic and stunning exits you can have for a wedding and the perfect idea for an evening exit. 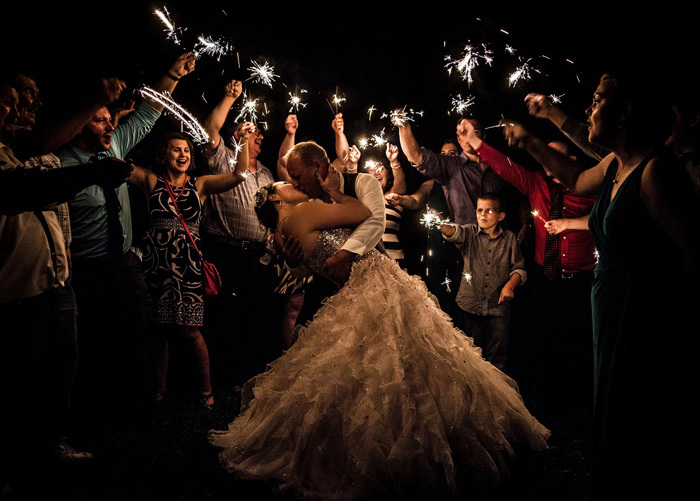 Surround yourself with your family and friends and let the sparklers give you an elegant and romantic glow as you leave as husband and wife. It's one of the latest trends to hit weddings; the gorgeous and fun colour bombs. These create a smokey and beautiful backdrop for you and your partner to exit from. Make sure to give your guests instructions for when and how to use these. This will ensure you get the most fabulous photos possible! Looking for something that screams glamorous? You really can't go past a little bit of sparkle! Trade out the traditional confetti or flower petals for some gorgeous glitter. Gold is a personal favourite of ours but don't be afraid to use colours to match your theme. Perfect for a blissful bohemian wedding, confetti is a fun, festive and fabulous way to bring some colour into your wedding exit! Be sure to check out eco-friendly options to save on clean up and ensure no environmental damage. Add some magical romance to your first night as husband and wife with a stunning lantern send off. This will paint the night sky with a soft glow and is such a breathtaking way to exit your special day.